When you’re establishing your small business, one of the first significant purchases you’re likely to make are new computers for yourself and any employees. For many people, this may be an easy decision; you might already be loyal to a particular brand because of your personal use, or you’re well-versed in the technical specifications and can easily identify which is the best office computer that meets your needs and fits within your budget. It’s also important to keep in mind that, while the majority of communications take place online these days, phones are still an important part of any business. More businesses are choosing voice-over-internet protocol (VoIP) phones which are cheaper and offer more features than traditional phones. RingCentral is a VoIP provider that offers unlimited phone calls, audio and video meetings, and apps that let you make calls from your smartphone or computer. It’s great for companies looking for a phone system that will scale with them. Try RingCentral free for 15 days. When choosing a new computer, the first decision you’re likely to make is whether you want a desktop or a laptop. Desktops offer more power for a similar or lower price but are fixed to your work station. Laptops, however, are smaller, lighter, and portable but this comes with a higher cost for similar or sometimes lower power. Desktops are also easier to repair and upgrade, where some components in laptops are integrated and/or fixed into place and can’t be easily replaced if something goes wrong. Because of this, we recommend that you only consider laptops for those employees who require the portability — salespeople, for example. If you’re looking for the best laptop for your small business, check out our guide here. For everyone else who’s work is limited to their desks, desktop computers provide a better value and will be the focus of this guide. The next question (or for some people, the first) you need to ask yourself is which operating system (OS) you would like your desktop computers to run on — Windows or Apple’s OS X. Windows is generally the standard choice, except for businesses that are focused primarily on design or graphics where you’re more likely to find Apple computers (colloquially known as “Macs”). And even then, Macs are gaining increasingly more market share and are more common in more traditional offices where employees are free to choose their own machines and are comfortable with the Mac user experience because of other devices they own personally (iPhones, iPads, etc.). If you don’t already know which of the two you’d prefer, we generally recommend Windows as it’s more widely-used. What Specs Should You Look For? The Screen Size is the size of the screen in inches, measured diagonally. This is an important consideration for any laptop as the screen is fixed to the computer; however, desktop computers usually have external monitors that you purchase separately. The Resolution measures how many pixels, which are tiny dots of visual information, fit on the screen measured in length x width. The higher the number, the more detail and data can appear on the screen. This is also an important consideration for any laptop, but not for a desktop as you generally purchase the monitor separately. The CPU Type is like the brain of the computer and the Speed is how fast it works. There are many variables that factor into a CPU’s performance, but generally speaking, a higher Hz means a faster computer. In most cases, 900 MHz or higher will be ample CPU speed for most small business needs. RAM or Random Access Memory improves your computer’s performance when you’re performing multiple tasks at the same time, such as browsing the internet and keeping other tabs open for web-based apps. In most cases, 4GB or higher will be ample RAM for most small business needs. The Hard Drive is the storage capacity of the computer. For desktops and laptops, hard drives are built in so we recommend 500GB or more. However, with the growing availability and decreasing prices of cloud storage services like Dropbox and Google Drive, this number is becoming less important. Now that you understand what each of the numbers refers to, let’s look at how the Apple Mac Mini, Asus Zen AiO Pro Z240IC, and Lenovo Ideacenter 300s compare. We recommend the Apple Mac Mini desktop because of its exceptional combination of performance and value, especially for an Apple computer. When trying to build a value-priced computer, you often have to accept some compromises. In the case of the Mac Mini, it’s Apple’s least expensive computer but it still comes loaded with powerful components and productivity software in a tiny package. The sleek aluminum chassis is one of the smallest desktop computers on the market, taking up a mere 7.7” square. But it’s what’s inside the case that counts and Apple delivers a lot of power and productivity software for the price. The Intel Dual-Core i5 at 2.6 GHz CPU, 8GB of RAM, and 1TB hard drive place it firmly among its peers in independent benchmark tests. 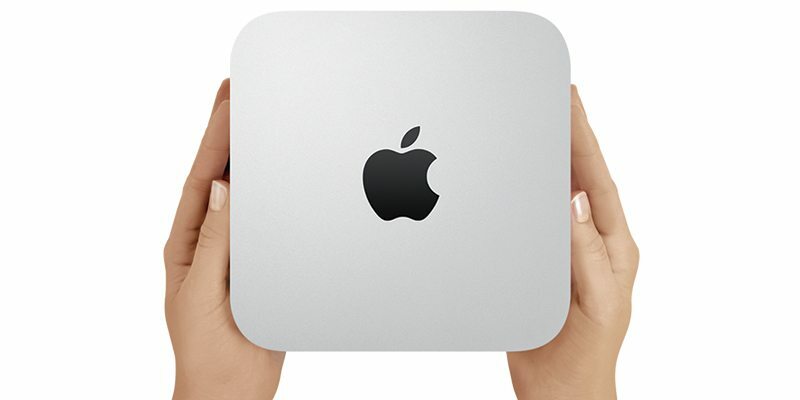 And with plenty of available connections, including an Ethernet, HDMI, SDXC card reader, two Thunderbolt 2, and four USB 3.0 ports as well as wireless 802.11ac and Bluetooth 4.0 available, the Apple Mac Mini will exceed most small business user’s connectivity needs. Apple’s biggest differentiator, however, is their OS X operating system and the productivity software that comes included with it. Anyone with an iPhone or iPad will be immediately familiar with the user interface and comfortable living within the Apple ecosystem and these other devices will integrate with the Mac Mini seamlessly. It also comes with iWork, Apple’s productivity suite, with programs like Keynote, Numbers, and Pages — their versions of Microsoft’s PowerPoint, Excel, and Word, respectively. Of course, Microsoft Office will work perfectly fine on a Mac if your business is committed to it, but iWork doesn’t require a paid subscription like Office 365 does. The one significant downside to the Apple Mac Mini is that individual components aren’t easily upgradable after you’ve purchased it, if at all. The RAM, specifically, is soldered to the motherboard; third-party services may be able to do the work for you, but this is not officially supported by Apple. However, it should be noted that Apple computers are known for retaining their value and performance for longer than most Windows-based machines and you may not feel the need to upgrade as soon as you would with another brand. Also, the Mac Mini doesn’t come with a monitor, keyboard, or mouse. The lack of a monitor is typical of budget-priced desktops, but the missing keyboard and mouse may come as a surprise when you unbox it if you’re expecting to find them. That said, at under $700 for excellent performance and Apple’s OS X, the Mac Mini is our recommended desktop computer for small businesses. All-in-one computers combine a desktop computer with a monitor to deliver a complete solution for your small business. And the Asus Zen AiO Pro Z240IC is at the forefront of the next wave of premium all-in-one computers and is our choice for the best overall for your small business. The premium all-in-one desktop computer market has long been cornered by Apple’s iMacs, but Asus is making a strong pitch for users who like the iMac’s power but prefer to work with Windows. The most obvious similarity between the two computers is their appearance. 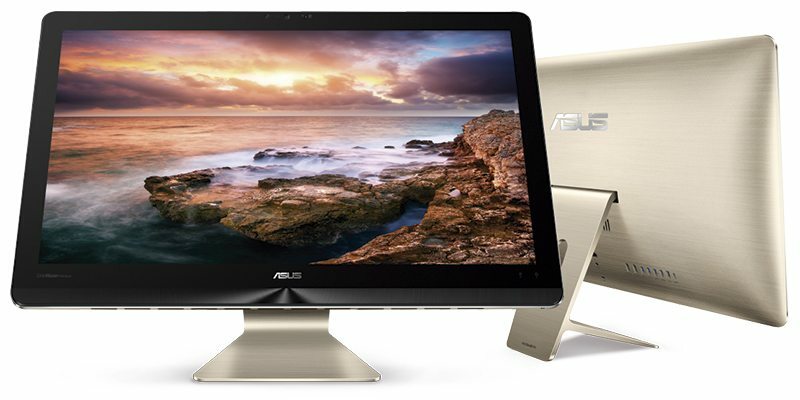 Like the iMac, the Asus Zen AiO Pro Z240IC has a sleek glass and metal design with a minimal footprint. Where the Asus Zen AiO Pro Z240IC really excels over its all-in-one peers is that it has a bright 23.8” 4K touchscreen plus an Nvidia GTX 960M graphics card and built-in Intel RealSense camera behind it. 23.8” may seem a little small for today’s monitors, but the 4K display, 3840 x 2160 resolution, and touchscreen more than make up for it and place it firmly in the premium category. But it’s what’s inside the Asus Zen AiO Pro Z240IC that’s most impressive. Asus has managed to include an Intel Core i7-6700T processor at 2.8 GHz, 12GB RAM, and a 1TB hard drive plus an additional 8GB SSD for quick access to the files you use most frequently — all for just under $1,500. An iMac with similar specs would cost $1,499 with a 21.5” screen or $1,799 for 27”, but neither of them is a touchscreen. The rear I/O panel includes the following ports: one USB 3.1, four USB 3.0, one USB 2.0, two HDMI-out, separate headphone and microphone jacks, and an ethernet jack and wireless connection options include 802.11ac wi-fi and Bluetooth 4.0. The Asus Zen AiO Pro Z240IC is an excellent premium all-in-one desktop computer for your small business. Its 4K screen, power, and storage make it an attractive alternative at a comparable price to an iMac for those users who prefer to work with Windows. Visual artists and anyone working with multimedia content will be particularly attracted to its impressive features. With its combination of premium features and mid-range price, the Asus Zen AiO Pro Z240IC is our recommendation for the best all-in-one desktop computer for your small business. 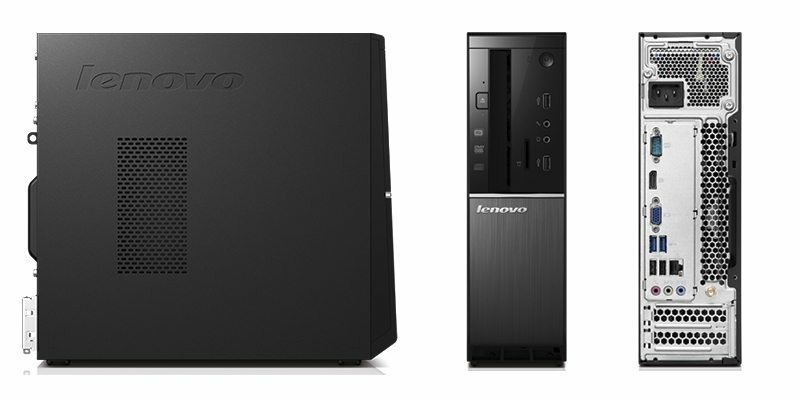 The Lenovo Ideacentre 300s shows that budget desktop computers don’t have to sacrifice power or performance. It’s powerful, compact, and affordable and comes equipped with ample power and storage to meet any of your small business’ needs. Driven by an Intel Core i5-4460s processor at 2.9 GHz, 8GB RAM, and a 1TB hard drive, you and your employees can multitask with ease, process complex calculations on spreadsheets, and store all of your documents, images, videos, and presentations with power and space to spare. 802.11ac wireless, Bluetooth 4.0, USB 3.0, USB 2.0, an SD card reader, and a DVD/CD burner round out this budget workhorse. And at 11.69” x 3.62” x 13.23”, which is about half the size of a conventional desktop computer tower, it has a small enough footprint to tuck away under your workstation discreetly. Like the Asus Zen AiO Pro Z240IC, the Lenovo Ideacentre 300s also comes with Windows 10 pre-installed. Desktop computers provide the widest range of options for your small business. They generally offer more features than laptops at a similar price point and are easier to upgrade and maintain should anything go wrong. They also allow for the greatest flexibility of components and peripherals to customize a solution for your specific needs. The Asus Zen AiO Pro Z240IC is a powerful multimedia workhorse and the Lenovo Ideacentre 300s is an excellent value, but because of its combination of features and price we recommend the Apple Mac Mini as the best desktop computer for your small business. Hi I’m going to school for Entrepreneural office applications certificate and I’m just wondering whitch computer would be best for me to buy for school. I have to have all Microsoft and QuickBooks and sage 50. I’m looking for a laptop? 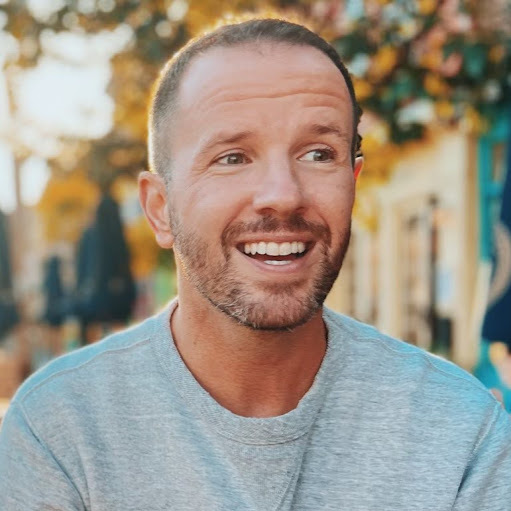 Hi, I’m running a business that uses skype to teach online. It is vital that the performance of skype is at it’s highest. There are no other specific needs for the computer other than emailing, word-processing and other simple business tasks. I am on a budget and would like to keep it below 700 € but am willing to go higher if needed. Do you have any suggestions? The quality of your Skype calls will depend more on your internet connection than on your computer. Most computers — even budget options — will be able to run Skype no problem, so I would recommend investing in the best internet connection you can afford. Hi I’m starting a home on line business. I was wondering what is the best computer that is fast and accurate! Also that my kids can do projects with? Your question is a good one, but there’s no one answer. The “best” computer for you will depend on your specific needs and budget. If you’re sharing the computer with your kids and don’t expect that you’ll be carrying it around, then a desktop might be the best option since they usually give you the most power and storage for the money. But if you want the convenience and portability of a laptop, then a Chromebook is a budget-friendly choice. Hi Gavin, Im starting a small business. What computer/laptop is best for me. I will travel w it and maybe prefer not a touch screen. I shop at Best Buy. I like the Apple or HP what do you suggest for Cyber Monday deals? There are some great deals online and at Best Buy this week, but the best deal depends on what type of laptop you think you’ll be most comfortable with — a Mac, PC, or Chromebook. Personally, I use a MacBook Pro. I will be doing Office Administration online, and I was wondering what would be best to do my course at home. I would need windows 7 or newer. We took a close look at the best laptops a few months ago. You can see our comparison here. Prices do fluctuate quite a bit – but you can at least use this as a guide to get started. This was wonderfully helpful, thank you. Glad to hear it Tammi thanks for reading and for the comment!